Most people are familiar with the most common types of employment discrimination – discrimination based on age, disability, race, religion, etc. – but there are other types of discrimination in the workplace that can be harder to spot; discrimination that, nonetheless, can have a significant impact on workers’ employment rights under the law. Many part-time workers (i.e. those who work less than 40 hours a week) find themselves the object of discrimination in the workplace; specifically, in the position of being passed over for particular projects or opportunities. While, at first sight, this might seem less “important” than other types of discrimination, in fact, it can prevent workers from important job promotions. Another type of discrimination that some workers experience is being treated unfairly due to family obligations. This most commonly shows up in the form of working parents who need a more flexible schedule due to family emergencies and/or child care requirements, or women denied jobs because they are pregnant (and are thus presumed to need to take family leave soon after starting their jobs). Family members have been bringing litigation and winning over this type of discrimination of late, particularly when they are denied or penalized for taking family leave. Gender discrimination doesn’t just show up in the form of discriminating against a working mother or deciding not to hire someone for a job because they are pregnant; it can rear its ugly head against both genders, including expecting a man to work long hours out of the assumption that he does not have family responsibilities. Handling the catering for meetings, amongst others. On the other hand, individuals who obtain positions that might be seen as traditionally belonging to the other gender might get labeled in a particular way (known as a “prescriptive bias”). This can sometimes show up as affording men who are secretaries less respect, or labeling women in executive positions as cold, etc. Dealing with harassment or unfair discipline in the workplace; amongst others. 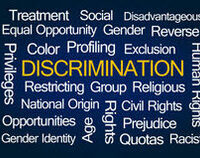 If you or a loved one has been the subject of employment discrimination – regardless of the type – we are here for you. Robert S. Norell has represented victims of employment discrimination in Plantation and surrounding areas for over 30 years. We’ve seen every type of employment discrimination scenario out there, and we’re ready to fight for you. Contact us today.